Hydrodesulfurization (HDS) or Hydrotreater is a catalytic chemical process widely used to remove sulfur compounds from refined petroleum products such as gasoline or petrol, jet fuel, kerosene, diesel oil, and fuel oils. The purpose of removing the sulfur is to reduce the sulfur dioxide emissions that result from using those fuels in automotive vehicles, aircraft, railroad locomotives, ships, gas or oil burning power plants, residential and industrial furnaces, and other forms of fuel combustion. Another important reason for removing sulfur from the intermediate product naphtha streams within a petroleum refinery is that sulfur, even in extremely low concentrations, poisons the noble metal catalysts (platinum and rhenium) in the catalytic reforming units that are subsequently used to upgrade the octane rating of the naphtha streams. The industrial hydrodesulfurization processes include facilities for the capture and removal of the resulting hydrogen sulfide gas. In petroleum refineries, the hydrogen sulfide gas is then subsequently converted into byproduct elemental sulfur. In fact, the vast majority of the 68,000,000 metric tons of sulfur produced worldwide in 2010 was byproduct sulfur from petroleum refining and natural gas processing plants. Although reactions involving catalytic hydrogenation of organic substances were known prior to 1897, the property of finely divided nickel to catalyze the fixation of hydrogen on hydrocarbon double bonds (e.g., (ethylene, benzene) was discovered by the French chemist, Paul Sabatier. Thus, he found that unsaturated hydrocarbons in the vapor phase could be converted into saturated hydrocarbons by using hydrogen and a catalytic metal. His work was the foundation of the modern catalytic hydrogenation process. Soon after Sabatier's work, a German chemist, Wilhelm Normann, found that catalytic hydrogenation could be used to convert unsaturated fatty acids or glycerides in the liquid phase into saturated ones. He was awarded a patent in Germany in 1902 and in Britain in 1903, which was the beginning of what is now a worldwide industry. In the mid-1950's, the first noble metal catalytic reforming process (the Platformer process) was commercialized. At the same time, the catalytic hydrodesulfurization of the naphtha feed to such reformers was also commercialized. In the decades that followed, various proprietary catalytic hydrodesulfurization processes such as the one depicted in the schematic process flow diagram below have been commercialized. Currently, virtually all of the petroleum refineries world-wide have one or more HDS units. By 2006, miniature HDS units had been developed for treating jet fuel to produce clean feedstock for synthesizing hydrogen for a fuel cell. By 2007, this had been integrated into a small operating fuel cell generation system. Many metals catalyse the HDS reaction, but it is those at the middle of the transition metal series that are most active. Ruthenium disulfide appears to be the single most active catalyst, but binary combinations of cobalt and molybdenum are also highly active. In practice, most HDS units in petroleum refineries use catalysts based on cobalt-modified molybdenum disulfide (MoS2) together with smaller amounts of other metals. Aside from the cobalt-modified MoS2 catalysts, nickel and tungsten are also used, depending on the nature of the feed. For example, nickel-wolfram (Ni-W) catalysts are more effective for hydrodenitrification (HDN). Metal sulfides are "supported" on materials with high surface areas. A typical support for HDS catalyst is alumina. The support allows the more expensive catalyst to be more widely distributed, giving rise to a larger fraction of the MoS2 that is catalytically active. In an industrial hydrodesulfurization unit, such as in a refinery, the hydrodesulfurization reaction takes place in a fixed-bed reactor at elevated temperatures ranging from 300 to 400 °C and elevated pressures [ranging from 30 to 130 atmospheres of absolute pressure], typically in the presence of a catalyst consisting of an alumina base impregnated with cobalt and molybdenum. The image below is a schematic depiction of the equipment and the process flow streams in a typical refinery HDS unit. 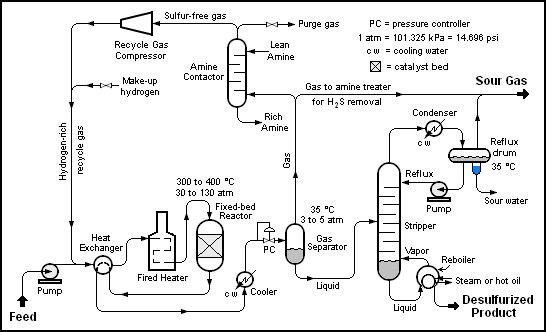 The liquid feed (at the bottom left in the diagram) is pumped up to the required elevated pressure and is joined by a stream of hydrogen-rich recycle gas. The resulting liquid-gas mixture is preheated by flowing through a heat exchanger. The preheated feed then flows through a fired heater where the feed mixture is totally vaporized and heated to the required elevated temperature before entering the reactor and flowing through a fixed-bed of catalyst where the hydrodesulfurization reaction takes place. The hot reaction products are partially cooled by flowing through the heat exchanger where the reactor feed was preheated and then flows through a water-cooled heat exchanger before it flows through the pressure controller (PC) and undergoes a pressure reduction down to about 3 to 5 atmospheres. The resulting mixture of liquid and gas enters the gas separator vessel at about 35 °C and 3 to 5 atmospheres of absolute pressure. Most of the hydrogen-rich gas from the gas separator vessel is recycle gas which is routed through an amine contactor for removal of the reaction product hydrogen sulfide gas (H2S) that it contains. The H2S-free hydrogen-rich gas is then recycled back for reuse in the reactor section. Any excess gas from the gas separator vessel joins the sour gas (i.e., gas containing H2S) from the stripping of the reaction product liquid. The liquid from the gas separator vessel is routed through a reboiled stripper distillation tower. The bottoms product from the stripper is the final desulfurized liquid product from the hydrodesulfurization unit. The overhead sour gas from the stripper contains hydrogen, methane, ethane, hydrogen sulfide, propane and perhaps some butane and heavier components (i.e., higher molecular weight components). That sour gas is sent to the refinery's central gas processing plant for removal of the hydrogen sulfide in the refinery's main amine gas treating unit and through a series of distillation towers for recovery of propane, butane and pentane or heavier components. The residual hydrogen, methane, ethane and some propane is used as refinery fuel gas. The hydrogen sulfide removed and recovered by the amine gas treating unit is subsequently converted to elemental sulfur in a Claus process unit. Note that the above description assumes that the HDS unit feed contains no olefins. If the feed does contain olefins (for example, the feed is a naphtha derived from a refinery fluid catalytic cracker (FCC) unit), then the overhead gas from the HDS stripper may also contain some ethene, propene, butenes and pentenes or heavier components. It should also be noted that the amine solution to and from the recycle gas contactor comes from and is returned to the refinery's main amine gas treating unit. The refinery HDS feedstocks (naphtha, kerosene, diesel oil and heavier oils) contain a wide range of organic sulfur compounds, including thiols, thiophenes, organic sulfides and disulfides, and many others. These organic sulfur compounds are products of the degradation of sulfur during the natural formation of the petroleum crude oil. When the HDS process is used to desulfurize a refinery naphtha, it is necessary to remove the total sulfur down to the parts per million range or lower in order to prevent poisoning the noble metal catalysts in the subsequent catalytic reforming of the naphthas. When the process is used for desulfurizing diesel oils, the latest environmental regulations in the United States, Europe and elsewhere requiring what is referred to as ultra-low sulfur diesel (ULSD) requires that very deep hydrodesulfurization is needed. In the early 2000's, the governmental regulatory limits for highway vehicle diesel was within the range of 300 to 500 ppm by weight of total sulfur. As of 2006, the total sulfur limit for highway diesel is in the range of 15 to 30 ppm by weight. The basic hydrogenolysis reaction has a number of uses other than hydrodesulfurization. The hydrogenolysis reaction is also used to reduce the nitrogen content of a petroleum stream and, in that case, is referred to Hydrodenitrification (HDN). The process flow scheme is the same as for an HDS unit. In fact, units may be designed for both hydrodesulfurization and hydrodenitrification and many are so designed. The hydrogenolysis reaction may also be used to saturate or convert olefins (alkenes) into paraffins (alkanes). The process used is the same as for an HDS unit. Some hydrogenolysis units within a petroleum refinery or a petrochemical plant may be used solely for the saturation of olefins or they may be used for simultaneously desulfurizing as well as denitrogenating and saturating olefins to some extent. The food industry uses hydrogenation to completely or partially saturate the unsaturated fatty acids in liquid vegetable fats and oils to convert them into solid or semi-solid fats, such as those in margarine and shortening. ↑ 1.0 1.1 Gary, J.H. and Handwerk, G.E. (1984). Petroleum Refining Technology and Economics, 2nd Edition. Marcel Dekker, Inc. ISBN 0-8247-7150-8. ↑ 2.0 2.1 Leffler, W.L. (1985). Petroleum refining for the nontechnical person, 2nd Edition. PennWell Books. ISBN 0-87814-280-0. ↑ Process for Converting Unsaturated Fatty Acids or their Glycerides into Saturated Compounds. British Patent: GB 190301515 (A), November 26, 1903, granted to Wilhelm Normann. ↑ Kinetics and Interactions of the Simultaneous Catalytic Hydrodenitrogenation of Pyridine and Hydrodesulfurization of Thiophene, John A. Wilkens (August 1977), PhD Thesis, Massachusetts Institute of Technology (MIT). This page was last modified 03:52, 12 October 2013.